Scary, funny and compelling in all the right ways isn’t it? Reminds me a little of Coraline, and I mean that in a good way. …and it also has a very clever campaign that includes the poster below and these. Honestly, the campaign just might be a little too clever. But that is not all! This year will also see the release of the Rob Marshall musical Nine. Which loses, because it has no poster yet. (Ok, I know, I know, plenty of time). And none of those has anything at all to do with The Nines. 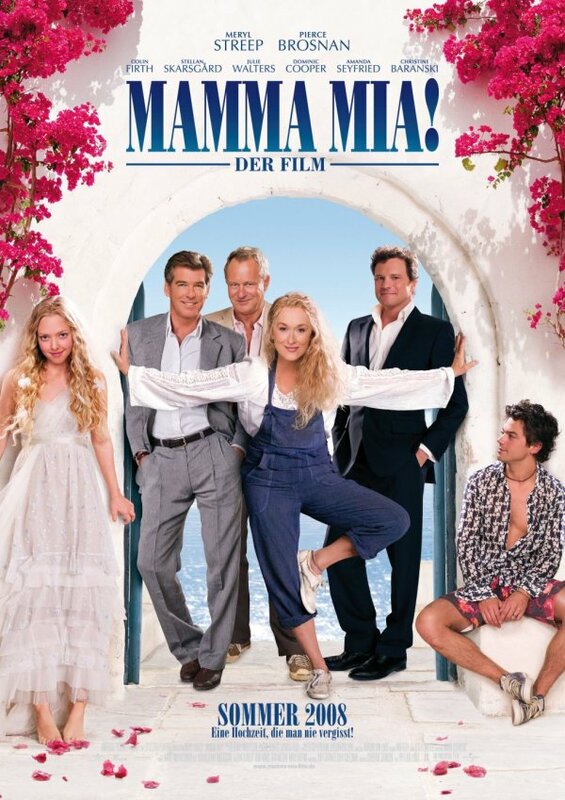 The German poster for Mamma Mia! ups the testosterone level by about a thousand percent. Not only do we get to see the three possible fathers of the character played by Amanda Seyfried, we also get random young groovy dude (Dominic Cooper, I think). And yes, in this one we get to see Meryl Streep in her full overalls glory. And that is… something. Still not sure if it’s something good or not yet. The first domestic poster was very focused on the mother/daughter thing and gave little space to the rest of the story. It was very sweet but also very narrow and it seemed mostly concerned with making this attractive to women. The German poster tries to have a much broader appeal by letting the larger story in and by showcasing all the talented actors involved in the film. It also has a more humorous feel to it. And that is all good, by I find myself missing the simplicity and clear focus of the earlier poster. This one tries to pack a little too much in and we end up with an image that is not confusing, but also is not very harmonious. It’s not awful either, but I think it loses some of the effectiveness of the original, which wasn’t that great to begin with. And it does seem a lot less confident on the ability of the source material, the musical itself and ABBA, to make the movie an easy sell. The first thing I noticed when I saw this poster was the scenery. The beautiful blue ocean on the back, the architecture, the flowers. The scenery was also one of the things that most caught my attention when watching the trailer. I guess I just expected a musical using ABBA’s songs to take place somewhere different. Perhaps somewhere cold. Going beyond the setting we have Meryl Streep and Amanda Seyfried looking happy as can be. Amanda seems to be wearing a wedding dress, but I probably wouldn’t have noticed that if I didn’t already know the movie involved a wedding. As a matter of fact the poster doesn’t really strive to tell you what the film’s story is. Not only is it not clear that there is a wedding, the whole storyline about Sophie (the character that Amanda plays) inviting the three men she thinks could be her dad is completely absent. Instead the poster combines the scenery and the characters’ expressions, clothes and postures in order to get across a very upbeat and breezy tone. And that is probably not a bad choice. The story is a little too complicated to really put well in a poster, and trying to do it might have subtracted from the movie’s appeal instead of getting people more interested. In the end the most important part of the poster is the title. The musical and ABBA are huge properties and there are already plenty of people out there interested in seeing this. 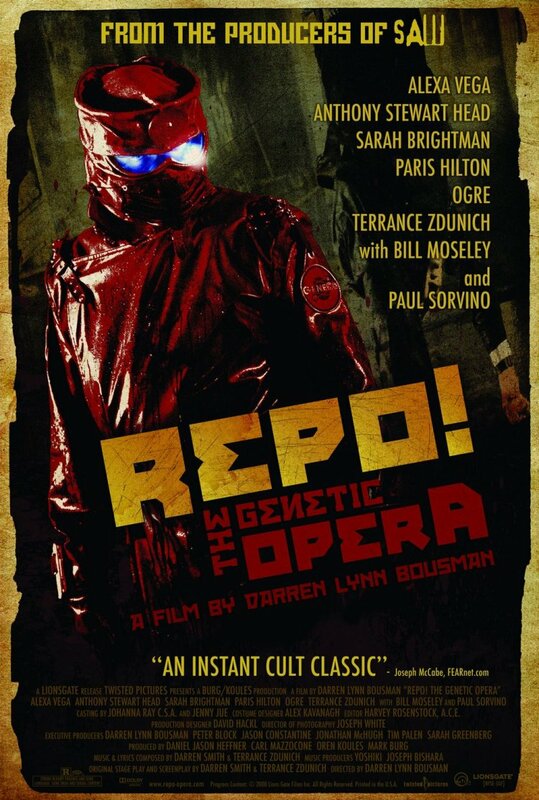 The poster just tries to remind people that yes, this is being turned into a movie and to reinforce that this is going to be a fun time at the theater. And I think it does that well, even if it is playing it safe. 7 character posters for two characters. Seems like a bit of an overkill, doesn’t it? And the tone of all the posters is very similar, so the different versions for each character don’t seem to add much. Which is not to say that I don’t like the posters. In fact, I love them. 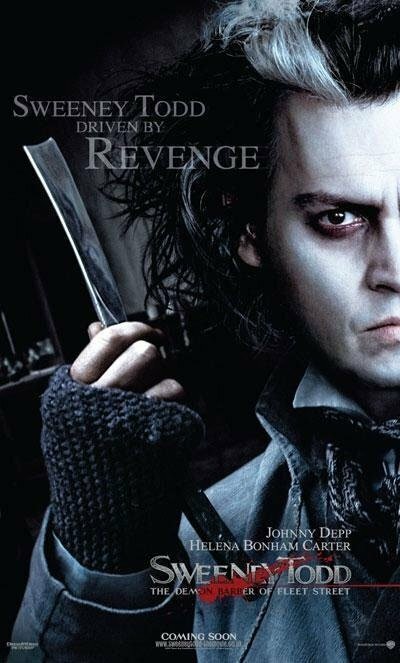 I love the very dark mood, the style of the clothes and the environment, the little bloody details like the fingers in the pie, and the look in Depp’s eyes, sometimes mischievous, sometimes just murderous. 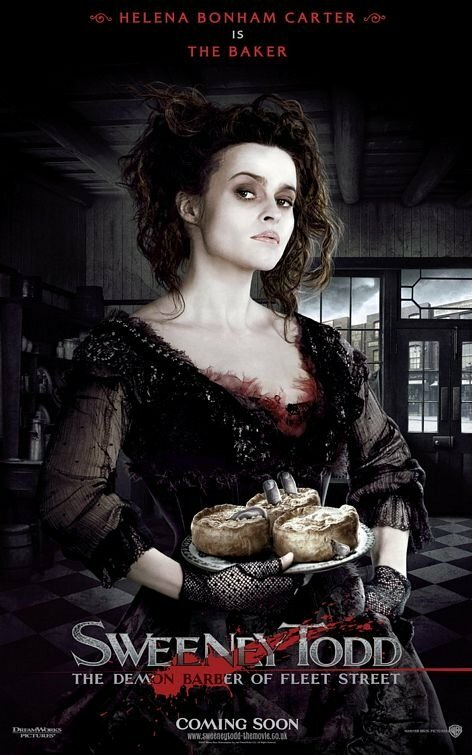 The posters also scream “Tim Burton movie!”, and that is mighty fine by me. 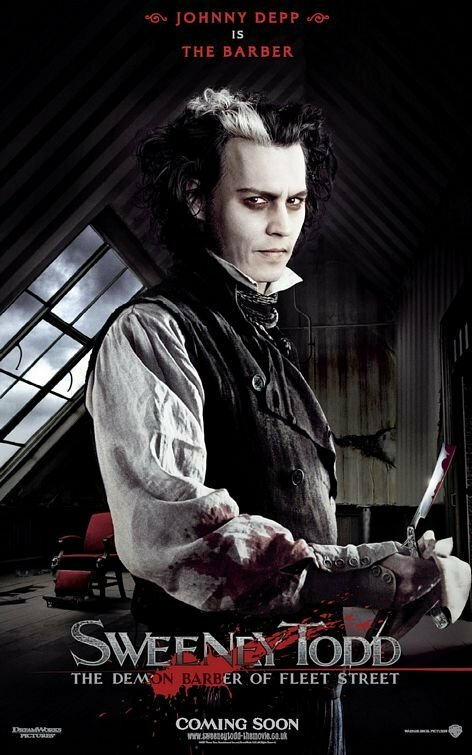 Sweeney Todd strikes me as a hard sell. A musical about a serial killer? Those two genres don’t generally go together. They do have the now very hot Johnny Depp, which helps, but still. I think the posters do a very good job of selling the quirky horror movie aspect of the film. Obviously, there isn’t much they can do about the singing. 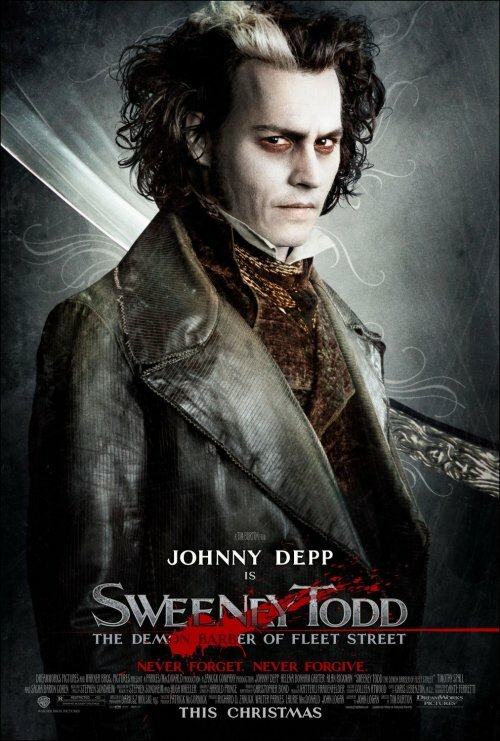 Is Tim Burton (and his style) now mainstream enough for this type of movie to reach a broader audience? I don’t know, but I sure hope so. 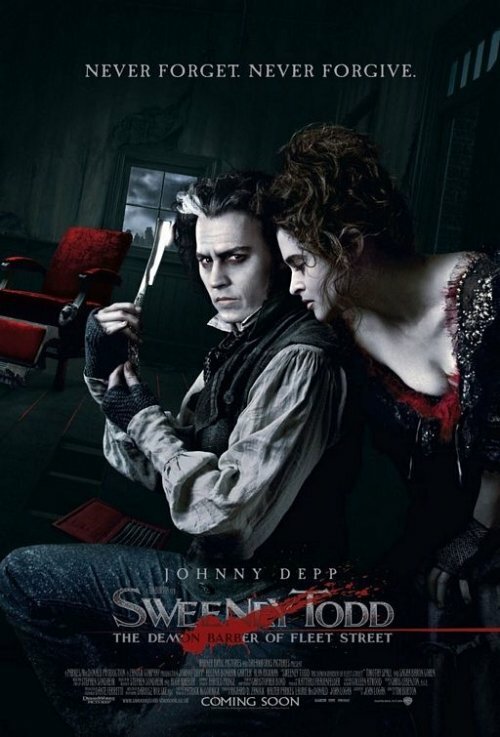 This second poster for Sweeney Todd feels much more like a teaser poster than the first one. It shows much less of the main character, who only appears as a silhouette, and the setting is a street somewhere, which seems much less specific than the apartment in which the first poster was set. 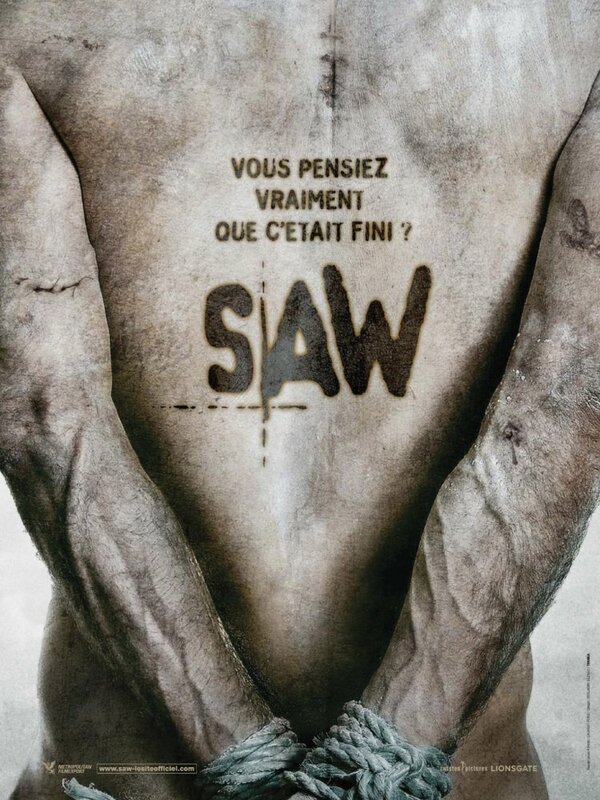 And the beware sign is a classic teaser poster element. It’s a little weird that this poster would be released after the first one. What I also find interesting about this poster is that, although it does seem to convey a dark mood, it is much easier to think that this might be a classic Tim Burton horror/comedy based on it. 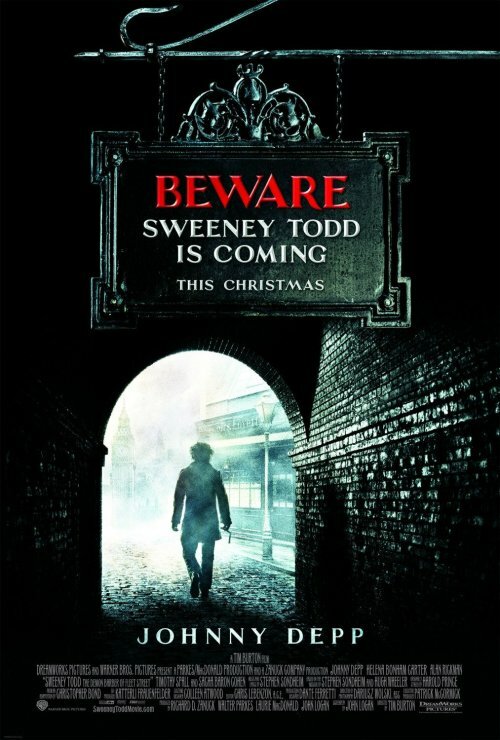 The Beware sign, for example, seems a little too on the nose for a more straight horror film. The first poster seemed to convey a much more serious and unambiguous dark tone, which was perhaps a little odd. Anyway, I don’t think this poster adds much. But I’m still excited about the film and I will take anything a can get right now.